Layoff notice is written by the employer when he decides to lay off the employee. The termination of an employee takes place for many reasons. If the employee is not performing well or remains absent from work, the employer has a right to terminate him from the job. It should be kept in mind that the employee is laid off according to the terms and conditions specified by the employer at the time of recruitment. It is very important for an employer to keep the layoff simple and fair. The employee should not feel that this notice is discriminatory. Since the employee is going to miss everything because of this notice, he should not be given any negative feeling through this notice. The details of the notice are very important to be considered with care. There should not be an important detail missing in the notice. If you want to draft a professional looking layoff notice, make sure that you have used the professional notice format along with a formal language. It should also be ensured that the language used in the notice is easy to understand. Since the layoff notice is a formal document, it should not be too lengthy. Make sure that you have added all the details to it in a concise way. 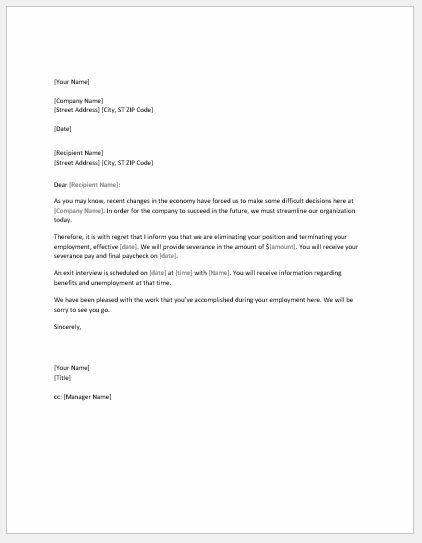 Tell the employee in clear words that he is being terminated from the job. Mention the reason for termination. Add some positivity to the notice by appreciating the employee for working for your company. End the letter with the request to return those things to the company that is in employee’s possession.